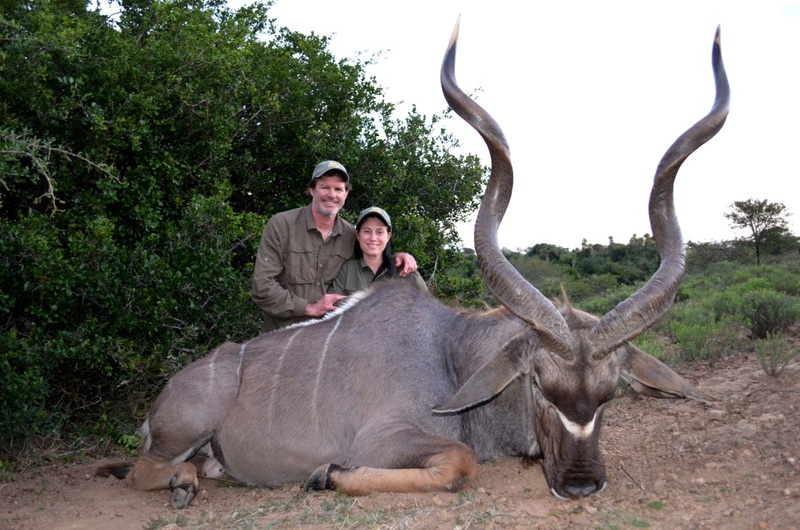 The story of OUR East Cape Kudu Hunt…..
We first met Randy Spence and Emily Belue at the Dallas Safari Club through our good friends the Arnette’s in early January 2013. At that stage we’d been in correspondence over email, but had never met. As I saw a couple approach me early one morning I just knew this was them. Kristie Arnette had described Emily to perfection. A fun-loving happy individual! Randy was quieter at first, but over time I’ve come to know a great guy and made a good friend. Their safari was to be their first hunt with John X Safaris, and their maiden trip to Africa. The hours of waiting soon turned to days, weeks, and months. May finally arrived and so did their safari! An excited Randy and Emily arrived in Port Elizabeth and spent the first night in town before we collected them for their safari. Our safari would see us hunt from our coastal and northern areas, experiencing the magic of the coastal region and the querkiness of the quiet Karoo with its dark starry nights. While there were many great moments and hunts, there was one particular hunt we enjoyed most of all. It’s often a favorite for most, and was certainly the highlight of our safari. This is the story of OUR East Cape Kudu hunt…. Kudu hunting is addictive. Some of us love it, others don’t see the fuss or understand the passion for pursuing these gray ghosts. It’s a matter of personnel choice. Ask the team of PHs at John X Safaris what’s their favorite game to guide and 80% will come back with a quick reply, “Kudu”. Ask me, and I’m more hesitant. It’s just that there are certain periods in the year when Kudu vanish off the face of the earth. Where they go nobody knows? But come next season and the start of the rut, they’re popping up behind every bush. And it is at this time that Kudu hunting is at its most exciting. Lucky for Randy he found himself slap bang in the middle of Kudu hunting paradise! 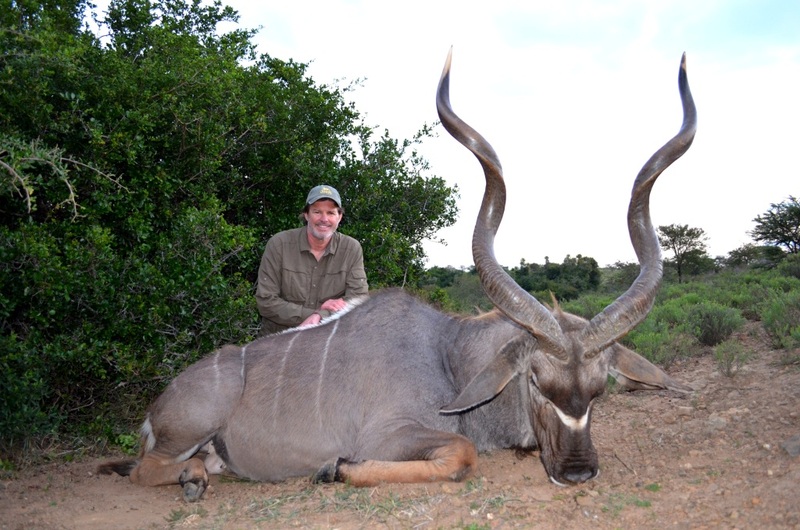 Randy”s Kudu hunt started like many before, at 5am that first morning. Right off the cuff we started spotting a number of Kudu, but nothing worth pursuing. 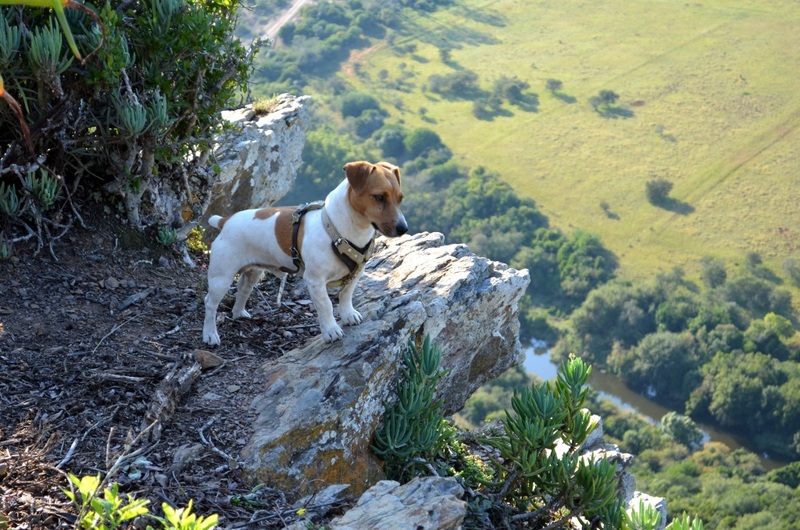 At mid morning we bumped into a great Warthog – it wasn’t a Kudu, but the hunt was on. Our boar was feeding in a clearing below our glassing position. With a number of Kudu sharing the same area we knew the trick would be to go as undetected as possible while covering the final 200 yards to our boar. 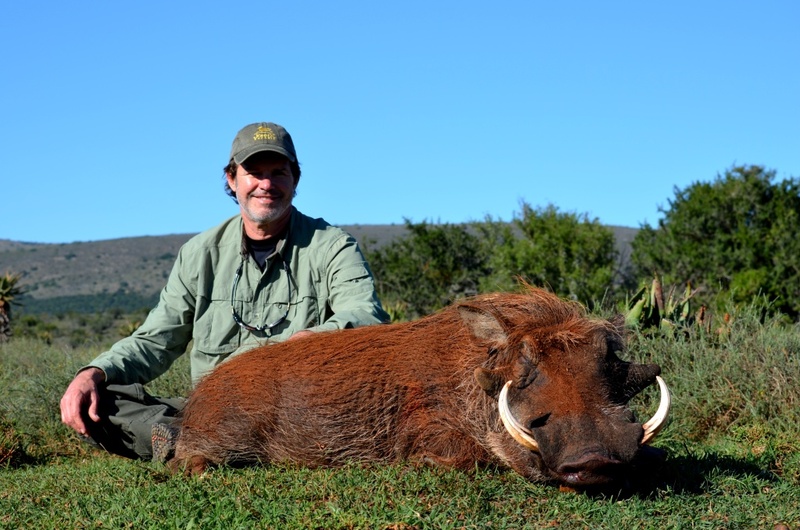 With a steady breeze and decent cover we were able to get within 100 yards of our pig, not a Kudu, let alone the Warthog even knew we were there until the 300 WinMag roared into life. Randy’s African safari was off to a great start! It was midday, day one, and our pig was in the salt – an exciting afternoon of Kudu hunting lay ahead. With a back pack stocked with a good supply of water and all the necessary equipment, Randy and I set off on an afternoon of wandering. The rut was in full swing and the thought of the possibility of a number of bulls being active throughout the afternoon proved a pretty exciting aspect. A slow start at first soon materialized into a shooter bull appearing out of nowhere to clear the field below us. Just as he’d appeared – he disappeared. I could see the look of amazement on Randy’s face, how could he have come so quickly and then dashed our hopes even quicker? Welcome to Kudu hunting my friend, the ghosts had started their age-old game once again. I wasn’t going to share that with Randy, it’s best he figure that out on his own. It’s what makes Kudu hunting the sport it is. Later that afternoon we spotted him again, this time much closer than where we’d originally spotted him, but he was 300 yards off and dusk was upon us. It was time to call it a day, head back to camp, and see what Emily had been up to during the course of the day. Emily had opted for a day of R&R while us boys were out hunting. Something tells me she enjoyed a pretty successful day of R&R with the camera too! The next morning saw us up at five again. A quick cup of coffee and light bite to eat and we were off in an easterly direction. Today would once again be a Kudu day. 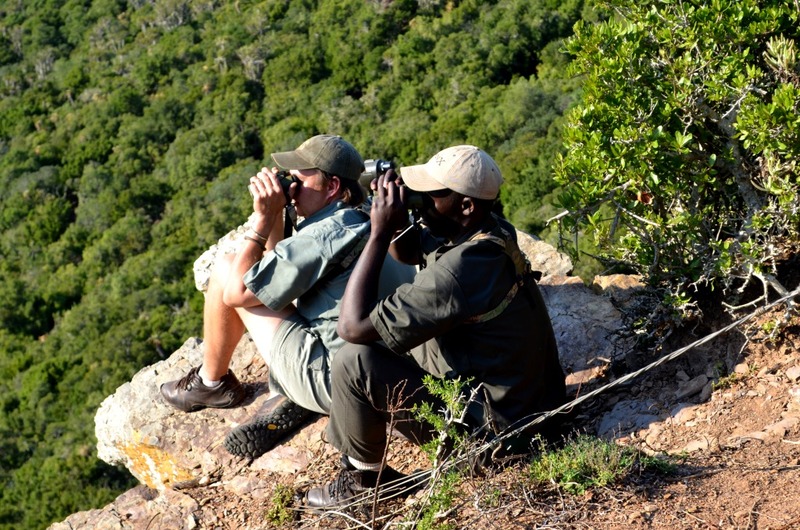 Zwayi our trusty tracker had spotted a great bull a couple of days earlier and was adamant we try one particular area. The area he had his heart set on was an open plain running along the top of two deep wooded ravines, the perfect home for a large population of Kudu. 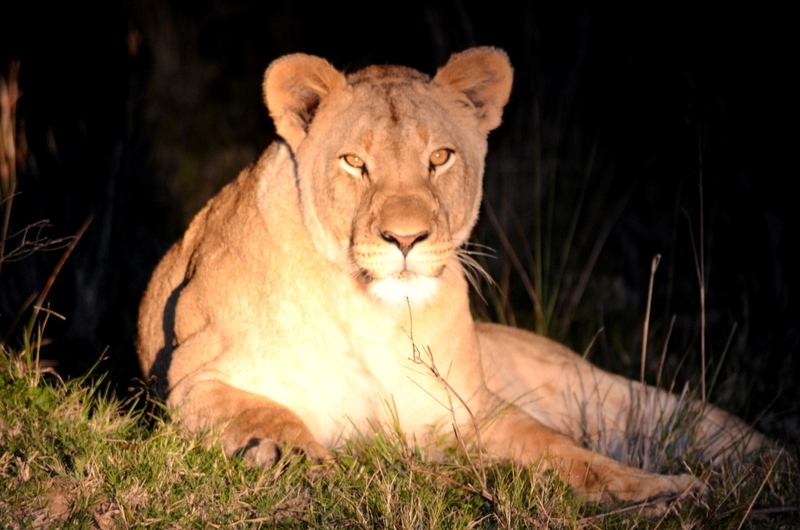 As we approached the clearing we spotted him immediately, there he was – just as Zwayi had predicted. A magnificent old bull. Immediately we gathered our gear and headed for our quarry. Deja vu – the one minute he was there, feeding contentedly in broad day light, the next he was gone. It felt like day one all over again. With disappointment we headed back to the truck. It was still early in the day and there was so much to still see in this beautiful area. By midday the temperature had peaked to 90 F, no Kudu, let alone any other game were going to move during the hottest part of the day. It was time for a pick nick lunch and a minute to rest weary glassing eyes. By four that afternoon the game was on, things were starting to look good. Our weary bull from earlier in the day had made a sudden appearance once again. Randy took one look at him and needed no second invitation. With so many other eyes in the form of Eland, Impala and Blesbuck, sharing the same area as our bull, we decided to take the safest and longest approach. By theory we should go unseen, but one never knows with so much game about. The first 300 yards of our stalk went well, only a small family group of Zebra, which busted out in the opposite direction. Not like them or us had a choice, we met each other face to face at 15 yards coming towards one another on a narrow path. A lucky break I remarked to Randy, maybe this was a sign of things to come – Lucky things…..
Leaving our breaths, hopes, and nerves, behind in the Zebra ordeal we continued on. A mere 80 yards further, still hugging the tree-line, coming around a bend in the vegetation we walk slap bang into a monster Kudu. Hallo! Where did you come from? To late, what were we expecting at 20 yards. We’d been walking so quietly with a steady breeze at the nose that we were going literally undetected, our timing unfortunately was out by minutes. Had we been delayed a mere 5 minutes, then the monster we’d busted coming into the clearing to feed would have been feeding in broad day light ahead of us. A butterfly net, that’s what I always say – we wouldn’t have needed more than that! Then again it weren’t butterflies we were after, weary old Kudu bulls, like this beauty breaking out ahead of us leaving us with glimpses of flaring ivory tips and a heavy lumbering ghate. The stuff dreams are made of. Either way, time to move on, our bull was still up ahead. He was just as good if not better than the bull we literally walked into. Covering the last 150 yards to a predetermined shooting spot, hoping our bull was still there, we bumped another bull at less than 20 yards. This time the bull we were after. To say that I was frustrated would be the least of my flavored vocabulary I had chosen for the occasion. Experiencing the sinking feeling of dread watching two big bulls in the space of minutes disappear at close quarters was becoming too much to handle. Randy must have though his PH had lost his mind, having a moment whispering into his cap, then returning with a blood-red face. Yes folks – this dream job has its moments. When you as guide know how important a Kudu is to your hunter, it’s important to find the right bull with the required trophy qualities. Age first – then length, but then the experience of tracking him down and providing your hunter with a comfortable setup to take the shot. Forget about challenging – that the Kudu will provide, trust me, ask my cap about challenging. Ok, time to move on I thought to myself. If there were big bulls busting out within minutes from one another, then surely there’d be more? While the going looked good we were going to run with it. The particular tree line we were following ran adjacent to a steep gorge with the other side tapering ever nearer towards the top of the valley. During the course of our stalk we’d noticed a group of Kudu cows feeding on the opposite ridge, the rut was on and waiting this group out until dark seemed a good idea and the only sane option at that stage. We grabbed a seat under an Acacia tree. The view was good and the wait was on. As our wait drew on and the sun crept lower onto the horizon our eyes started wandering. I call this the desperate glassing period of the day, one starts seeing things not because they’re there, but because you want to believe they’re there! Thank goodness it was interrupted by a group of Eland feeding a mere 30 yards off to our left and a great Impala ram who seemed keen to take a better look at these two odd-looking creatures hiding in the grass under his favorite Acacia tree. Only later did we notice the tree we’d chosen was his scratching post – sorry fellow, we had important matters at hand. With about 40 minutes of day light left we turned our concentration to our bait, now feeding directly opposite us. The group of Kudu cows had narrowed the distance between us and them, best of all they hadn’t seen us. We waited quietly. Suddenly Randy spotted a big bull on the trail of the cows 600 yards out. This was it – now or never. We’d endured enough “bad luck”, which it really wasn’t if one were to look back, one should consider oneself lucky to have seen that many great bulls at close quarters in the same afternoon. At the time we didn’t see it that way, we were now determined more than ever to sit tight and have the approaching bull get within shooting distance. From 400 yards he spotted the cows he was trailing, he kept coming. At 196 on the range finder I let out a loud whistle just as the bull stepped into a clearing in the brush. He stopped dead in his tracks, looked up, turned his head in our direction and froze. A better setup we could not have hoped for. The bull was broadside, Randy was sitting comfortably, his body anchored by the rifle and the shooting sticks. He clicked the safety button forward… This was it. To express my regret of not having my trusty camera or video camera along on this particular occasion would be the least I could say. To explain the scene of a weary old Kudu bull a mere 200 yards out, locked onto attention is a sight to behold. Something any serious or romantic hunter should experience at least once in his lifetime. It’s a privilege being part of the scene. As Randy touched off the 300 WinMag the bull reared up onto his back legs, regained his footing and took off into the brush. Silence…..
We couldn’t hear or see anything further, it was time to call in the recruits, our trusty dogs, Bongo and Foxy. We approached the exact spot where last we’d spotted Randy’s bull, but we needn’t have bothered the dogs, there he was, laying quietly with a perfect heart shot. Randy had concluded a perfect day with a fitting shot. Perfect in ever way….. An old warrior past his prime. The perfect bull to take. Having Emily along on Randy’s Kudu day was as much a highlight as hunting our bull. Her excitement is infectious to say the least, let alone her fun nature she brings along to every occasion. 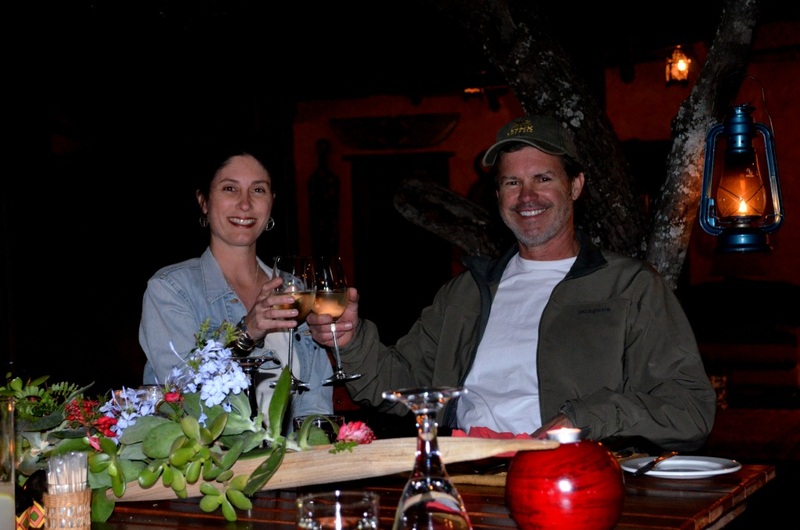 That evening called for a celebration in camp, Randy had hunted his dream Kudu, Emily the love of his life had been along to share in the adventure, while I was content with the experience I was able to “provide”. I say “provide” in a hesitant manner, for that we have Africa and a magnificent Kudu to thank. The fact that we were in the right place at the right time is a matter entirely of its own.